If you want, cuddles, passionate exchanges and gestures of undying love, please give Mr Aquarius a wide berth. This man is the most emotionally inarticulate chap in the zodiac - he has deep feelings but he simply cannot deal with them. If he is in danger of falling in love with you, he’ll treat you with apathy, he may even seem to actively dislike you. But that’s his way of protecting his feelings. He is on very firm ground when he’s with his friends or with a group of people, discussing current affairs and telling jokes; he’ll be in a serious state of panic on a one-to-one basis with a woman he finds attractive. Like all cerebral men, he is deeply drawn to passionate and emotionally complex women, who drive him stir-crazy and prove the point that love is for the birds. He is kind of endearing though in his ingenuousness, and he can be very faithful once he’s found his heart’s desire. An Aquarius woman is like a butterfly as she is social, friendly, yet, does not truly belong to anyone. However, do not ever doubt her love and loyalty once she is committed to you. 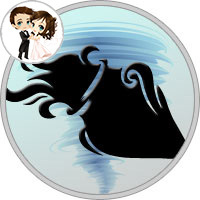 Once married, an Aquarius woman will be a caring and faithful wife. You must let her pursue her interests, pursue a career of her choice, and socialize with her friends. You must also be willing to accept and appreciate all her friends as they are equally important to her.This woman likes to be treated as an equal. Displaying emotions like jealousy, possessiveness, chauvinism will make her turn away from you. She does not prefer sentimental men. Be sympathetic to her or she will just retreat and remain completely aloof. She will never be an overly possessive mother, but a jolly one, more like a friend. You may even find her talking to her kids’ friends like an equal. An Aquarius woman makes a loving and devoted mother. Though it is difficult for her to adjust to motherhood, she is a devoted mother, once she is comfortable in the role.As being aloof is in her nature, she will face difficulty in expressing affection to her kids. But, she will make her kids feel special. She will teach virtues like truthfulness and humanity to her kids. Understanding Aquarius women completely is a bit difficult because of their unpredictability. But, you will never be bored with her as she is charming, pleasant, and is able to talk on any subject. Beneath her flighty exterior, is a caring woman who is always there for her near and dear ones. So, cherish her if you find her. Ciao!